Tonight, one of my closest girlfriends is getting married. It is a black tie affair. It is being held at the Taj. It will undoubtedly be one of the fanciest events I've ever attended. And I am beside myself with excitement. But who knew gala affairs required so much preparation? Between choosing the perfect dress, getting nails and hair done, figuring out shoes, make-up, jewelry, a purse, and a shawl I feel like I've been mentally preparing for this night for months. I can't begin to imagine what it must have been like to plan the event from soup to nuts! It must have been like taking on a second job. I'm so glad the bride & groom have a nice long honey-moon awaiting them, starting tomorrow morning. When I first began conceptualizing an outfit for the evening I wanted to go for something different: a fun, lively, evening gown with lots of sequins and shiny stuff on it in some bright, exciting hue, like mauve or cerulean. I ended up with the exact opposite: I walked out of the department store 20 minutes after I walked into it, the proud new owner of a simple, plain, floor-length black gown made of a totally pedestrian fabric, with thick straps and a simple neckline. It was the first dress I tried on and the least expensive dress in the entire evening department. But the fit? It was simply perfect. I learned a very important fashion lesson that evening -- sometimes going with what you know isn't being boring. Sometimes it's simply the only option. There's a reason I'm always drawn to the little black dress -- because it always looks perfect. And if that's the case, well, why fight it? But the real fashion epiphany came when I decided upon my main accessory for the evening: my hair. It's only fitting, n'est-ce pas? Hair has been such a focus of my thoughts and scholarship the past few years,that it only makes sense that I should make hair the centerpiece of the outfit. I will visit my dear Jason to make this a reality, of course. But since he doesn't do up-do's, my options are limited. I was stumped about what to request for styling at first, and thought a boring blow out would be my only option. 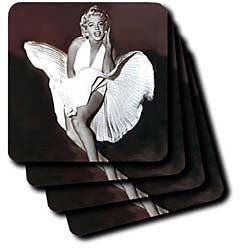 Then, while setting my water glass down on my somewhat disconcerting Marilyn Monroe coasters the other night, it hit me: deep side part, big, soft curling-iron curls, et voila! 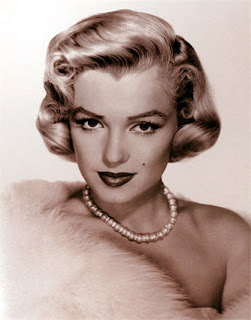 Simple elegant, old-school glamour, much in the fashion of the Grande Dame of Bombshell Blondes. I'm leaving for my hair appointment in a few minutes, and can't wait to see what Jason does. I hope it all comes together -- I'm cutting it pretty close with a 3:45 hair appointment. Then again, if the look isn't perfect, who cares? This isn't my day, it's the brides. My simple goal is to be as pleasing an addition to the backdrop of her photos as possible. Thanks to Spanx, Jason's deft hair stylings, a killer dress, and $100 worth of make-up purchased impulsively at the Chanel counter, think I can make it happen. But, goddamn! Being fancy is a lot of work. The biggest trick to doing glamor is knowing you should be there...If you know you should be there, jeans would work.